Sarah is still in her yellow nightie with a short white robe over it, barefoot. Chuck has put a blue-grey suit jacket on over his pajamas. Sarah begins the ceremony wearing a doily on her head, simulating a veil. Chuck reaches for it and removes it ceremoniously. Sarah is smiling widely, laughing. Chuck laughs too. The moment has tremendous symbolic significance. Sarah has been veiled from Chuck for most of the time he has known her. While the veils protected her, kept her from being known, they also made it nearly impossible for her to make herself known. Our faces harden into the contours of the masks we wear. Chuck has removed those veils with painstaking care. He now removes the last. He knows this woman. She is gladly known. She knows this man. He is gladly known. ‘Know’ has older meanings–perhaps most famously used in the Authorized Version–like to approve and to acknowledge with due respect and to commit or have. These meanings coalesce here. Their wedding celebrates and consecrates their mutual knowledge. Sarah picks up a piece of paper on which she has written her vows. Chuck gently chides her. This is their wedding ceremony. He has written his vows in a leather journal–a document appropriate to the occasion. But Sarah is satisfied with her vows. Sarah: I think I covered the bases. Chuck: Ok, cool. Yeah, good, good. You go then I’ll go and then we’ll have a little note session, afterwards. Chuck is listening with his eyes closed as Sarah begins to read. He opens his eyes as the words reach his heart. Sarah begins by reading but ends speaking the words from her heart directly to Chuck’s heart, heart to heart. The woman who is no good at the saying-how-she-feels part says how she feels with more direct, economical and poetic power than anyone else–including Chuck–ever manages. She summons and commands a word magic here, one that even Chuck, for all his articulateness, cannot summon or command. 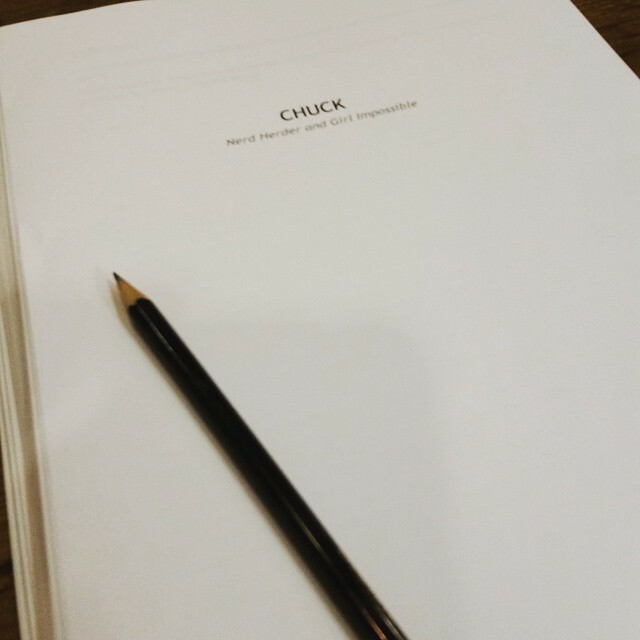 Perhaps it is overcoming all the years of living at a distance from her feelings, refusing and abusing them, perhaps it is the freshness of her efforts to express herself, perhaps it is Chuck’s ability to invite expression from her. Perhap it is all of these–and also perhaps it is love itself, love’s uncanny ability to raise us above ourselves, to allow us to do and be what we never imagined we could do or be. Sarah speaks from within the glow of a mandoria, the meeting place of the person she was and the person she hopes to be–the person she is and keeps becoming. In their very first extended conversation, in the Mexican restaurant, Chuck used a complicated rhetorical figure to make a joke about Devon. Sarah uses one to capture the multiple-dimensionality of her life with Chuck: she wants to spend the rest of her life with Chuck, to learn (for) the rest of her life with Chuck, she want to love Chuck and to love with Chuck (to share the things they love) for the rest of her life. The three verbs, ‘spend’, ‘learn’ and ‘love’ all govern ‘the rest of my life with you’ but they do so in different ways. But the most striking feature of Sarah’s vows is the way in which they transfigure Chuck and reveal the way he has transfigured her. Just before Sarah walks to Chuck for the first time, she is on the phone being briefed about him. He is her asset. Asset. An asset is something disposable, something to be used. He is now her gift. Gift. A gift that she deserves and wants to keep deserving. Gifts are not mere assets. Assets I can have with no question of desert. But not gifts. Gifts impose responsibilities on the person who receives them. If someone paints me a picture and gives it to me, and I take it home and use it as a serving tray, that will be taken (so long as there is nothing else to say) as an expression of contempt not only for the gift, but also for the giver of it. Sarah knows how lucky she is that Chuck appeared in her life–a comet lighting up her darkness, quickening her numbness–and she wants him to know how grateful she is. Her vows give thanks for Chuck. The asset she unveils as a gift. Wonder overcomes Chuck. Her vows plumb his heart, find in it depths of responsiveness he did not know it had. She asks if the vows were talky. He tells her the vows are perfect, so perfect. He hugs her to him. After Chuck and Volkoff save Sarah, we are taken into the ceremony just after Sarah’s has made her vows. The bells peal joyously. Sarah sighs, satisfied and relieved, and Chuck begins to speak. Chuck: Right. My vows. My turn for that. They just don’t cut it. I’m sorry Sarah. How do I express the depth of my love for you? Or my dreams for our future? Or the fact that I will fight for you every day? Or that our kids will be like little superheroes, with little capes and stuff like that? Words can’t express that. They don’t cut it. So no vows. I’ll just prove it to you every day for the rest of our lives. You can count on me. Chuck of course makes vows here. What he means is that he will not read the vows he wrote. Sarah’s vows already made him describe them as a complete tear down, a page one rewrite. He has not found anything better that he can prepare to say. And so his vows are his confession of inarticulateness before this woman and the prospect of a life with her. The man of words finds that they have deserted him. Chuck has attempted a raid on the inarticulate but returned empty-handed. The guy who is good at the saying-how-he-feels part fails to find words. But his very inarticulateness is expressive. Sarah is closer to him than words are. She has accepted his invitation into the very heart of who he is–and so it is easier for him to show her his avowal than to say vows to her. He is her very own baggage handler. He is her guy. He will fight for her. She can count on him. He is very available. His schedule is wide open. Wonder does not see its objects possessively: they remain ‘other’ and unmastered. Wonder does dwell in its objects with rapt attentiveness. With [the interrogatory element] may persist also an odd sense of the gratuitousness of the object and its qualities. Its existence strikes us as a gift, undeserved. A sense of unlikelihood pervades the experience. Both Sarah and Chuck, each in his or her own way, is struck by the gratuitousness and the unlikelihood of the other. Each is struck by the sense that the other is ‘other’ and yet belongs to him or her. Each is struck by the fact that the other, loved and trusted, remains still unmastered. Their fidelity to each other will be, will have to be, a creative fidelity. They vow to dwell with each other in rapt attentiveness.